I’ve just bought a Denon AVR-X2200W AV Receiver and it’s a lovely bit of kit, but it doesn’t play nicely with my MacBook pro 2015 over HDMI. I use the same cable to plug my MacBook Pro into the Receiver, then (using another identical HDMI cable) plug the Receiver into the same TV using the same HDMI port. I configured the Receiver to not process the incoming signal, so essentially allow it to pass though. This time, the TV showed a slightly over-scanned version of the MacBook display. This was fixable by dragging the overscan slider on the Mac. However, the problem was that every four seconds the TV/Receiver/MacBook re-initialised the display which resulted in the TV going black and the connection being renegotiated, then the image of the MacBookPro desktop would come back again. Its important to note that I’m not playing a video or running iTunes while all this is happening, it’s the the MacBook Pro desktop that’s being shown on the TV. The MacBook resolution didn’t reset itself, so it knew the HDMI connection hadn’t changed. If the HDMI cable had been unplugged or the Receiver disconnected from the other end, the MacBook would have changed back to it’s native resolution. The mouse pointer froze for a fraction of a second every time the TV display went black, so the MacBook was either doing something or responding to something coming back down the HDMI cable. Every time the image came back on the TV, the TV’s on-screen-display showed the resolution and frequency of the incoming signal. This suggests the signal had been stopped then started again or the TV told to re-examine and re-negotiate a connection. The AV Receiver’s on-screen-display also disappeared when the TV went black, which suggests that the source of the reset instruction is coming from the MacBook and being passed through unaltered to the TV. I swapped out all the HDMI cables and tested again with new high-speed/ethernet-enabled cables. There was no change and the same behaviour was exhibited. I tested the same AV Receiver/MacBook/Cable combination on two other TVs. A 24″ Sony and a 58″ Samsung Series 6 Plasma. In every case, the continuous re-initialisation of the display still happened. The AV receiver is either altering or filtering the HDMI commands sent from the MacBook Pro to the TV or from the TV back to the MacBook Pro which is causing the MacBook pro to repeatedly send HDMI handshaking commands. During my search for whether other people were experiencing this behaviour, I discovered that Apple has been quietly rolling out High-Bandwidth Digital Content Protection (HDCP) to it’s machines via OS X updates. I always keep my MacBook Pro up to date so it’s running the current version of OS X El Capitan. It also turns out that Apple has been slowly removing makes and models of video equipment from it’s list of “supported” kit. I can understand why Apple would want to prevent users from purchasing a film on iTunes, then “recording” it to another machine via HDMI. Unfortunately this has the unpleasant side-effect of preventing users from hooking the MacBook Pro to an “unsupported” projector or TV for presentation purposes. 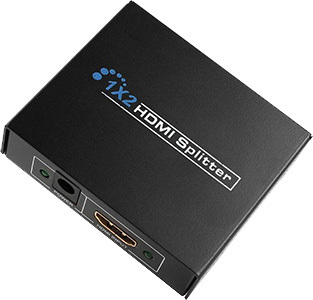 After a bit of digging around online I discovered that there are a number of cheap HDMI splitters available that take one HDMI input and duplicate it to two HDMI outputs. A side-effect of this “splitting” of the signal is that the HDCP commands are filtered out from the source signal and are not relayed back from any connected output devices back to the source device. After reading through reviews of various products, I bought one of these splitters from Amazon.co.uk for £9.99 (with free P&P). I connected the output of the MacBook Pro to the single input of the splitter and connected one of the outputs of the splitter to the input of the Receiver. I used the same HDMI cables are before. The effect was that the TV displayed the MacBook Pro desktop just as before, but this time it no longer reset itself every few seconds. Additionally, the mouse pointer on the MacBook Pro didn’t freeze every few seconds, so it wasn’t trying to re-check anything all the time. This sounds very interesting – I am having the same problem (intermittent black screens with my macbook pro) accept to my Denon 4200W. Would I need an HDMI splitter that passes through 5.1 to my receiver, or will this do the trick with regards to outputting 5.1? Thanks for the research! Been a nightmare to solve this. I’m not sure if my last comment went through. I have the same issue with my 4200w and my macbook pro. Would this splitter output 5.1 through my receiver, or would I need to buy one that was 5.1 capable? Yes this splitter passes 5.1 audio through from my MacBook Pro to my Denon amp no problem. I’ve used it with Dolby Surround, Dolby Digital and DTS sources and the audio is passed through unaltered. 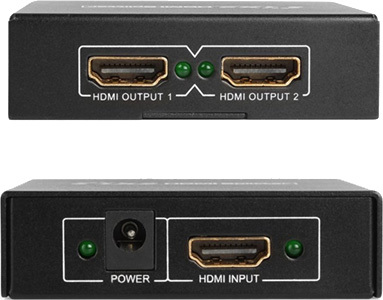 Also, would the HDMI splitter have to NOT be HDCP 2.2 compliant – to avoid the same handshaking issues? Is this why you went for this fairly budget one? Because it is not HDCP 2.2 compliant? I tried an inline HDMI auto-switch which was HDCP 2.2 compliant and it had no effect. The problem persisted. Looking at the Amazon listing again, it looks like it’s HDCP claim has been retracted so you may be right in that because it’s non compliant, it’s been priced accordingly. Ok man, thanks a lot. I’ve just ordered it so I will let you know how I get on! Please do let me know if it solves your problem. Just one more thing… I’m assuming that to get 5.1 surround sound films via mac.. I connect everything, then go to sound preferences and select the hdmi output of the receiver. And also go to audio/midi setup, select the av receiver and select multi channel? and configure speakers. Will that do the trick? Is that all I need? With the receiver on (and the splitter installed), I connect the HDMI cable to my MacBook Pro. The display on my MacBook changes to 1920 x 1080. Then on my MacBook, I go to System Preferences -> Sound -> Output and change it to “DENON AVR” (or something like that). I use VLC Media Player to play content with 5.1 audio, so I start VLC. Load the media (like an MKV file) into VLC and hit play. Go to Audio -> Audio Track and make sure the correct audio stream is playing. You can see what streams are available and how they’re encoded under Window -> Media Information -> Codec Details. This is useful because it might be that the audio stream you want to play doesn’t have all the channels you’re expecting i.e. 3F2R/LFE (3 front, 2 rear + low frequency effects a.k.a. 5.1) or DTS. Go to Audio -> Audio Device and make sure “HDMI (Encoded output)” is selected as opposed to “HDMI”. This ensures the raw audio is passed straight through to the receiver and isn’t altered or downsampled by VLC. When you change these options, the receiver may respond immediately. If it doesn’t change, just stop playback in VLC and hit play again. Thanks Adrian, You’ve been lots of help today – more than Denon! So I tried the splitter this weekend, and the intermittent black flickering stopped which was great. But the issue now, is that it doesn’t recognise the receiver – it labels it as Samsung (HDMI) instead of Denon AVR4200w (Which it does list without the splitter). It also only allows 2 channels within the audio/midi setup in utilities, whereas it allows up to 8, and works without the splitter. It also doesn’t pass through 5.1 audio within VLC? It just says HDMI, instead of HDMI (encoded) – which it displays without the splitter. Not sure what to do, do you have any suggestions – does the splitter pick up the receiver in the output in preferences? I have a mid 2013 macbook pro, I’m still running an older OSX as it allows me to use more 32 bit plugins for my music. Would this affect it? I was going to pick up another splitter that was a little more expensive, but still looks like it would filter the HDCP. My MacBook Pro (2015) running OS X El Capitan v10.11.5 sees my Denon receiver in System Preferences -> Sound -> Output as “DENON AVR” with the splitter installed. Sometimes it does come up as SAMSUNG, but I fix that by unplugging the HDMI cable from the MacBook, the reconnecting it with the received turned on and with the correct HDMI input selected. The older version of OS X you’re running could certainly have an effect on how multi-channel audio is output over HDMI. Which version of OS X are you running? I am running OSX 10.8.5 i think.. Multi channel audio is fine outside of using the splitter though.. It runs the audio well with the splitter not being a part of the circuit. It is worth noting I am using a hdmi to displayport/thunderbolt adapter too, to go into my Macbook pro. But once again, it works fine with the splitter not being a part of the circuit. It is interesting that yours also says SAMSUNG on occasion.. I will try replugging it as you said this wknd coming. Any other thoughts after reading this? It sounds like someone else is experiencing what you’re describing. I’ve had a look in that thread, but couldn’t locate the similar problem? Any chance of directing me to it? Great work on solving this issue. I have a similar issue and wondered if you had any thoughts. I have a Denon AVR-3000, and I connect my MBP to the “Media Player” input on the receiver. When I select the Media Player input on the Denon, wverything works fine, I can watch movies over iTunes, etc. No screen flashing. When I select a different input (e.g., Game), the Mac screen flashes black every 3 seconds or so. The only way I can prevent this is to disconnect the HDMI cable from the Mac. The problem is, repeatedly doing this causes wear and tear on the HDMI adapter – I think I’ve managed to break 2 already due to this. Any thoughts on how to prevent the constant handshaking – will your splitter solve work in this situation? The fact you’ve said it flashes every 3 seconds suggests the Mac is repeatedly trying to handshake with the receiver. I’ve not tried this, so I’ll test it today with and without the splitter and I’ll I’ll let you know how I get on. I have an iMac 5k 27 inch (2016). Connected to my denno avr x2200. I have the flickering issue every 5/7 seconds. I bought the splitter and have the same issue. Nothing’s changed. My MacBook Air works fine (2014 model). I tried the splitter on the input side to the avr and the output side of the avr direct to the tele. This solved my problem with a Pioneer VSX-530-K. Luckily, I had an HDMI splitter stored that I never used and now it comes very handy. macbook pro supports 5.1 and 7.1 at the headphone connection socket by using an S/PDIF (optical) kabel. I have a Denon AVR-X4100W, an Optoma HD70 projector from 2006, and a MacBookPro from 2018. Now, connecting the MacBook directly to the projector works perfectly. However, when I tried connecting it through the Denon, the screen on the MacBook would just repeatedly flash to black every couple of seconds. On the Denon, go to the the ‘Setup Menu’ > ‘Video’ > ‘HDMI Setup’ and set the option ‘HDMI Control’ to ‘Off’. That’s great advice Thomas. Thanks for posting. Sometimes modern gear can be too smart for its own good! Stop using the same password everywhere! © 2019 Adrian Colegate. All Rights Reserved. All other registered trademarks or copyrights are property of their respective owners.